A peaceful corner of eastern England is temporarily awakened from its summer slumbers by the thunder of Merlin engines, the familiar roar announcing the safe return of a squadron of Lancasters from their latest operation. With wheels already down, the pilots throttle back the huge engines as the heavies make their final approach to the airfield nearby. Below them, quiet will soon return to the countryside and on base, after debrief, the weary bomber crews will take a well-earned rest. They don’t expect it to last long; they could be flying again tonight. The mighty four-engined Avro Lancaster was the most famous and successful night bomber of World War II. 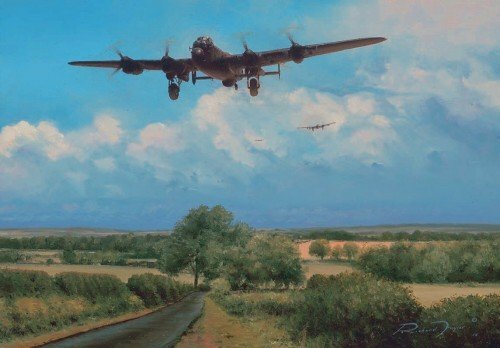 Flown by the RAF, RCAF and RAAF the much-loved Lancaster formed the backbone of Bomber Command. flying a total of 78 Operations.